“In search of a ‘design Esperanto’ in Greece: The case of fabric and dress designer Yannis Tseklenis” was the paper that I delivered as an invited speaker at the workshop entitled “The Business of Fashion: Historical Perspectives”, University of St Andrews (Scotland), 8-9 March 2012. 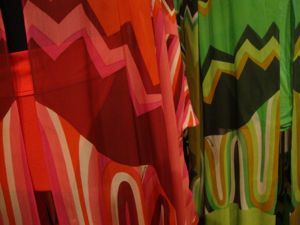 Big opportunities emerged for the Greek fashion industry during the 1960s, 1970s and 1980s, as manufacturing and especially textiles took advantage of low labour costs and the flexibility offered by local producers. Even so, private and public stakeholders failed to reach the consensus necessary to achieve sustained, design-oriented development, and the textile sector eventually declined. The activities of fabric and dress designer Yannis Tseklenis exemplify the potential that Greek design presented during that period. Tseklenis ambitiously attempted to innovate and operate within the international fashion system. His work grasped current trends and was based on a skilful matching of inspiration with recycling of existing styles and iconographies. The themes of his collections were drawn from a very eclectic range of subjects, including Greek antiquity, Byzantium, Impressionism, Russia, voodoo, and the work of contemporary Greek painters. His designs for female school uniforms also added a touch of style to an outdated institution. Promotional strategies emphasised the designer’s brand as an indicator of quality and as a strong selling point. The case of Tseklenis illustrates the dynamics of a design-based business attempting to combine cosmopolitanism and worldwide success with a sense of patriotism, local pride and the search for a uniquely Greek approach in the global arena.